France’s World Cup winners have followed up their summer success by powering their clubs to the knock-out stages of the Champion League. 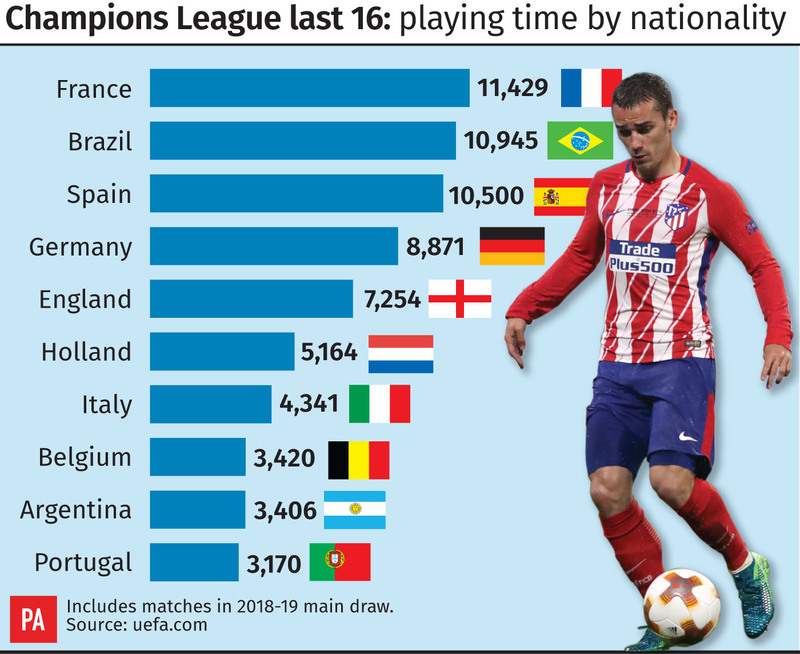 Research by Press Association Sport shows that among the 16 teams left in the competition, French players have had the most playing time in the competition proper. Their total of 11,429 minutes puts them ahead of Brazil, who with 10,945 edged out Spain (10,500) for second place. Here, Press Association Sport looks at the key facts arising from the data. France’s total includes four players who were ever-present in the group stage – Atletico Madrid forward Antoine Griezmann, Manchester City defender Aymeric Laporte and Lyon duo Houssem Aouar and Ferland Mendy. Griezmann’s fellow World Cup winner Kylian Mbappe is not far behind, playing 521 of a possible 540 minutes for Paris St Germain, while 14 Frenchmen broke the 400-minute barrier including five more of Didier Deschamps’ triumphant squad in Steven Nzonzi, Presnel Kimpembe, Paul Pogba, Lucas Hernandez and Nabil Fekir. There were 36 French players in all who took to the field in the group stage, compared to 35 from Brazil. Goalkeepers Alisson Becker and Ederson were two of five ever-presents among the latter’s representatives, with Paris St Germain forward Neymar just eight minutes away from making it six. Spain had far more players involved, 45, but Porto goalkeeper Iker Casillas was the only ever-present – no other Spaniard reached 500 minutes and only 10 including Casillas broke 400. Barcelona’s closing dead rubber against Tottenham played a part in dropping Spain from second place, with Gerard Pique and Jordi Alba unused substitutes while Sergio Busquets played only the second half. Fernando Llorente, Denis Suarez, Alberto Moreno and Sergio Gomez combined for seven appearances totalling less than 90 minutes. Almost 35 per cent of the playing time in the group stage belonged to players from those nations, the only three to break 10,000 minutes, while the top 10 in the study accounted for a hefty 72 per cent. German players were the closest to challenging the leading trio, racking up 8,871 minutes with the country’s own representatives Bayern Munich, Borussia Dortmund and Schalke accounting for almost 7,000. England’s four clubs – Liverpool, Manchester United, Manchester City and Tottenham – contributed almost the same to the nation’s fifth-placed tally of 7,254, embellished only by the 260 minutes Jadon Sancho played for Dortmund. Holland was the only other country with a total over 5,000, with Italy seventh in the standings on 4,341 ahead of Belgium – the World Cup semi-finalists’ 3,420 minutes edged out Argentina by 14. Portugal (3,170) completed the top 10. Nine other countries – Uruguay, Serbia, Poland, Croatia, Denmark, Switzerland, Morocco, Colombia and Austria – made it beyond 1,000 minutes, with Algeria rounding out the top 20 on 937. There were 47 nations represented in all, with the lowest tally being Nigeria’s eight minutes courtesy of Porto forward Chidozie Awaziem. Montenegro, Kenya, Guinea and Japan also managed fewer than 90 minutes. Four nations have players registered to teams in the last 16 who did not feature in the group stage. Kosovo goalkeeper Ari Muric was an unused substitute in all six of Manchester City’s games, while Canada’s Alphonso Davies failed to make Bayern Munich’s matchday squad. Republic of Ireland youth internationals Caoimhin Kelleher and Conor Masterson were unused members of Liverpool’s B-list, the same status as Guinea-Bissau’s Silvano Nater and Madi Queta with Atletico and Porto respectively.